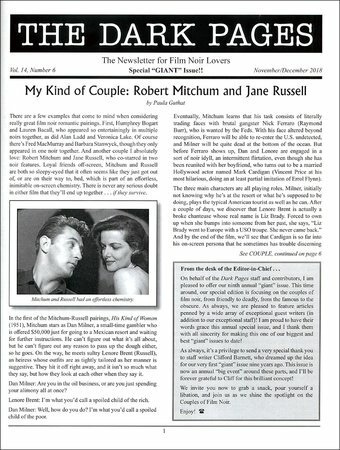 44-page "Giant Issue" features articles including "My Kind of Couple: Robert Mitchum and Jane Russell" By Paul Guthat, "Couples, Couples and More Couples" by Kristina Dijan, "Glenn Ford and Gloria Grahame" by John Greco, "The Prowler: Crooked Cop Woos Wealthy Dame" By Sylvania Bagley, "Alan Ladd and Veronica Lake: What Made Them Film Noir's Quintessential Couple?" By Andy Wolverton, "Dana Andrews and Gene Tierney in Laura (1944)" by Annette Bochenek, "Don't Try This At Home" by Barry A. Polin, "Eleanor and Frank: Woman on the Run (1950) by Kristina Dijan, "Noir in Life as On Screen: Gloria Grahame and Nicholas Ray" by Christian Esquevin, "Born to Kill: Sociopaths in Lust" by Elyce Rae Helford, "Painting with Light: The Noir Films of Anthony Mann and John Alton" by Rich Watson, "Great Couples of Noir: Where Are They Today?" by George H. Madison, "Max Monetti and Irene Bennett in House of Strangers (1949) by Patricia Nolan-Hall, "Fante and Mingo" by Stefen Styrsky, "Unsavory Duo: Lancaster and Curtis in Sweet Smell of Success (1957)" by Karen Burroughs Hannsberry, "More Sweet Smell" by Amanda Garrett, "Bonded by Murder: The American Friend" by Debbie Vega, "Dysfunction Junction: Bart and Laurie in Gun Crazy (1950)" by Karen Burroughs Hannsberry, "Film Noir Icons: Robert Mitchum and Jane Greer" by Raquel Stecher, "Beware My Lovely, Ida, When Robert's On Dangerous Ground" by Mike Perry, "Double Indemnity: A Study in Friendship" by Ruth Kerr, "Marcel Carne, Jean Gabin and French Film Noir" by Patricia Schneider, "Rita Hayworth and Glenn Ford: Good Friends; Hated Each Other in Film Noir" by C.W. Barnett, "Lucille Ball and Mark Stevens in The Dark Corner (1946): What Happens to You Happens to Me." by Jo Gabriel, "A Date with a Gun: He Ran All the Way (1951)" by Gill Jacob, "Barry and Belita in The Loop of Death" by E.A. Botta and "Chris and Kitty: Scarlet Street (1945)" by Karen Burroughs Hannsberry.